With my forthcoming cruise around the Antarctic Peninsula as the excuse, a few days ago I started posting some scans of slides dragged from the ancient past, when I spent two summer field seasons in Antarctica on British and Norwegian science programmes. 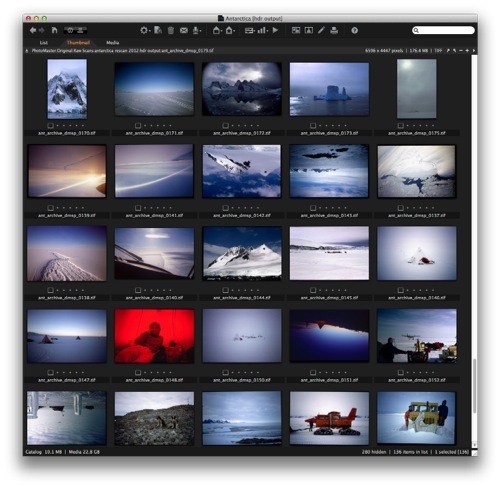 I’ve got something like 1500 slides from those trips, a mix of Kodachrome 25, Kodachrome 64, and Ektachrome (100, I think). About 250 I had selected around 15 years ago, and stored in archival boxes. The rest, some of which I’ve barely glanced at, are in the “rejects” folder. Many are in poor condition, having suffered fungus attacks. A large proportion are badly exposed, badly composed, heavily vignetted, or out of focus. Usually all of these. But some are interesting - to me at least, from a number of points of view. They show how I took photographs when I had no real idea of what phtography was about. Sometimes they are of some merit, but mostly they show that I was trying to tell stories to people back home, to capture atmospheres, moods and colours. There’s no real sense that I had any concept of “landscape photography” as an aim in itself. From a technical point of view, I’m benefitting from a lot more experience in scanning. I have had attempts at scanning selections in the past, in particular about 6 years ago, when I published a small book, but now I have a fully colour managed Kodachrome calibrated, Silverast HDR workflow, and I can use Silverfast 8 HDR. I started scanning on my Canoscan 9000F flatbed, but eventually switched to the Minolta film scanner. Even though the benefit with some of these slides is minimal, and I lose the 64bit HDRi option, the ability to auto focus, set the focus point, or fully manual focus on the Minolta is a significant benefit for extracting the finest detail.